French and African Union troops are struggling to keep the Central African Republic from dangerously splitting into two religious enclaves. But with continuing violence and atrocities committed by both Muslim and Christian militias against civilians, the country is becoming ungovernable. Humanitarian assistance is fast becoming dire, as millions become refugees in make-shift camps in their own country. The government, led by the newly appointed – Madame Catherine Samba-Panza, is facing up to the challenge of rebuilding state governance and authority, but lacks the resources to get the job done. Ban Ki Moon says that; “with no budget – hardly any resources and pervasive poverty, her abilities are sharply constrained. The path towards the restoration of state authority will be a long one”. Addressing the Security Council in New York last Thursday, the UN Chief was unequivocal, calling up the international community to face up to its responsibilities in preventing the Central African from sliding into further carnage and anarchy, risking the country becoming another failed African state. 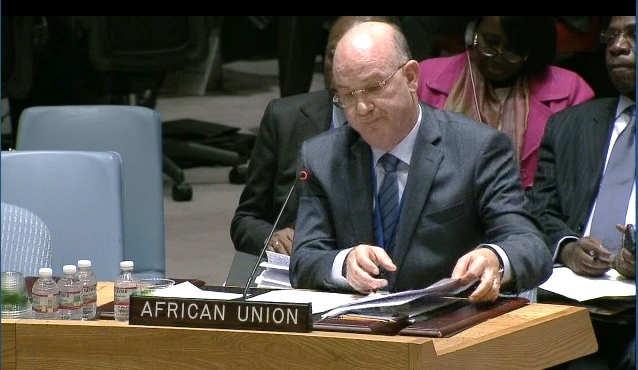 “I thank His Excellency Mr. Smail Chergui for his presence here today. I attach the highest importance to close ties with the African Union. We at the United Nations will continue to work hand-in-hand with you to promote development and lasting peace across the continent. The crisis that continues to unfold in the Central African Republic poses a test for the entire international community. 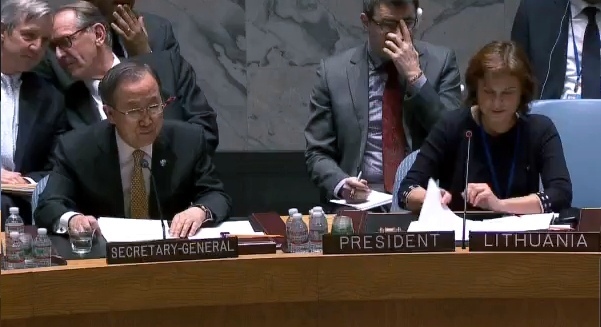 The situation in the country has been on the agenda of the Security Council for many years now. But today’s emergency is of another, more disturbing magnitude. It is a calamity with a strong claim on the conscience of humankind. Over the past year we have seen, in quick succession, the violent overthrow of the government, the collapse of state institutions and a descent into lawlessness and sectarian brutality. More than 2.5 million people — more than half the population — need immediate humanitarian assistance. The new Acting Head of State, Madame Catherine Samba-Panza, is committed to building state authority, and I commend her valiant efforts. But with no budget, hardly any resources and pervasive poverty, her abilities are sharply constrained. The path towards the restoration of state authority will be a long one. Innocent civilians are being killed in large numbers. These victims are not so-called “collateral damage” from fighting between rebel groups. They are being killed purposefully, targeted for their religious beliefs, for their community affiliation — for who they are. Muslims in particular are being targeted. But the ex-Seleka continue to attack Christians as well. Almost one million people have been displaced, with many homes burned to the ground with the purpose of preventing their return. Whole populations are being moved. A creeping de facto partition of the country is setting in, with Muslims in one part and Christians in another. This separation is laying the seeds of conflict and instability for years, maybe generations, to come. The African Union and France have deployed troops to the Central African Republic to help stem the violence. We owe those leaders and soldiers our gratitude for saving so many lives and providing protection where they can. We owe MISCA and Sangaris our solidarity and assistance. However, given the scale and geographic breadth of the violence, the security requirements far exceed the capabilities of the number of international troops now deployed. In places where there are no international forces, the choice for far too many civilians is to flee or be killed. The human family must not shy away from what is happening today in the Central African Republic, or from our responsibilities — both yours and mine — under the United Nations Charter. Events in the CAR have implications across the region, and summon us to defend universal values as well. This complex security, humanitarian, human rights and political crisis demands a comprehensive and integrated response. The United Nations is working with the African Union, the Economic Community of Central African States, the European Union and the World Bank to address the country’s diverse challenges. But those efforts will prove fruitless unless we do more to end the atrocity crimes, destruction of communities and mass displacement of populations. The Security Council has asked for my recommendations for a future UN peacekeeping operation, and I will soon report to you on the outlines of a mission with a robust mandate to protect civilians and promote stability. But the deployment of a peacekeeping operation, if authorized, will take months. The people of the Central African Republic do not have months to wait. The international community must act decisively now to prevent any further worsening of the situation and to respond to the dire needs of the country’s people. In that spirit, I propose today a six-point initiative to address the greatest risks being faced by the people of the Central African Republic. First, and most important, I call for the rapid reinforcement of the African Union and French troops now on the ground with additional deployments of at least 3,000 more troops and police. These new personnel, including formed police units, should deploy as soon as possible in the coming days and weeks, and have the necessary mobility, including air mobility, to be able to operate wherever required. AU Commission President Zuma has informed me that she will propose an expansion of MISCA to the AU Peace and Security Council. I welcome her initiative and urge Members of the PSC to endorse it. President Hollande of France has announced that Sangaris will be reinforced by some 25 per cent, to a total of 2,000. In addition, the European Union is poised to increase its planned deployment from 500 to 1,000, with an initial operating capacity on the ground in early March. I am grateful for these commitments. But more are needed, quickly, and the wider international community must share the burden. 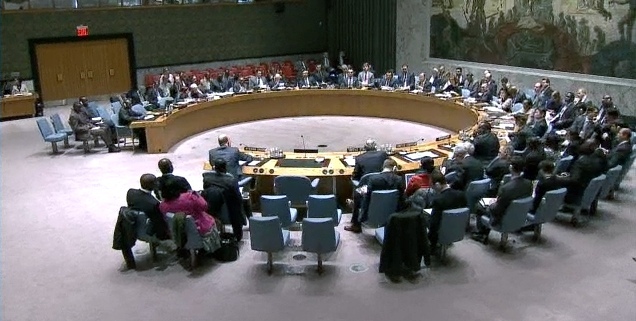 Second, I propose that all international forces in the Central African Republic be brought under a coordinated command, and that the mission of these forces be focused on the most urgent priorities: containing the violence, protecting civilians, preventing further displacements, creating a secure environment for the delivery of humanitarian assistance and laying the groundwork for the handover to a United Nations peacekeeping force as soon as possible. Third, I propose that the African troops that join this force be provided with logistic and financial support, including rations, water and fuel, and reimbursement for their major non-lethal military equipment. The estimated cost of this package, consisting of the bare essentials, would be US $38 million for a six-month bridging period. Fourth, I call for rapid, tangible support to the government of the Central African Republic to help it establish a minimum capacity to function. This support should include the financial assistance necessary to get police back on the streets, judges back in the courtrooms, and prison guards back on the job. I am pleased to announce that today Denmark confirmed a contribution of $2 million to this initiative, and I intend to see these resources put to use quickly. Norway has also confirmed today that it will make a donation to this effort. Fifth, I call for the acceleration of a political and reconciliation process to prevent a further fraying of the communal bonds, and to lay the ground for an end to conflict. Community and religious leaders will have an especially important role to play in promoting tolerance, peaceful coexistence and nonviolence. A political process will also require the dynamic engagement of ECCAS, the AU and the international community. I would like to pay particular tribute to the tireless efforts of the ECCAS Chief Mediator, President Denis Sassou-Nguesso of the Republic of Congo. The United Nations is reinforcing BINUCA’s analytical and operational capabilities so that we can help the national authorities to put the transition back on track, expand state authority and establish credible institutions throughout the country. Accountability and justice measures must be key elements of any peace and reconciliation process. More immediately such measures will contribute to the prevention of ongoing human rights violations. I am pleased to announce that the Chairperson of the Commission of Inquiry mandated by this Security Council, along with an advance team, will arrive in the Central African Republic to take up their important work. Sixth and finally, I appeal for urgent funding for humanitarian aid, which is currently insufficient to address the crisis. Only 15 per cent of the resources needed for this year have been received, despite generous pledges made at last month’s funding conference in Brussels. My Emergency Relief Coordinator, Valerie Amos, is in the Central African Republic. She has expressed shock at what she saw in Bossangoa today, and noted that tensions between communities are high, and that people fear for their lives. She stressed the need for more troops on the ground to provide security and protection across the country. Over the past few days, my senior colleagues and I have reached out to dozens of Member States to seek their support for my proposals. I have been encouraged by the positive responses. Some are considering sending additional troops and police. Others have pledged to provide budget support for the Government. These commitments will bring tangible dividends in the coming days. The United Nations, for its part, thanks to generous support from Canada and others, has allocated $5 million from the MISCA Trust Fund to provide essential communications equipment to African troops, and those items are being delivered in Bangui as I speak. The six-point initiative I have just put forward aims to support and complement the hard work now being carried out by a range of actors. It is designed to achieve the most pressing objectives: stabilizing the security situation, and saving lives that would otherwise be lost to senseless sectarian hatreds. The proposals call for contributions from many quarters. They also compel us to avoid a piecemeal approach in which some proposals receive more support than others. To succeed, the proposals must be embraced and implemented as an integrated whole. We know what is happening in the Central African Republic. We know why it is different from previous outbreaks of violence. We know why it matters to all of us and what we must do. Knowledge is not all we have. Through collective action, as envisaged by the United Nations Charter, we have the power to stop the killing and save the Central African Republic from its current nightmare. I urge the Council to support my proposal, and I urge Member States to take the action necessary to implement it. Let us show the people of the Central African Republic that the United Nations stands with them and that the support they so urgently need is on its way. The people of the Central African Republic await the response of the international community to Ban Ki Moon’s plea. Will the USA, China and the European Union step up to avert another intractable humanitarian crisis in Africa?